Amazon's new bookstore is only four days old but it has already inspired more opinions than your average political debate. 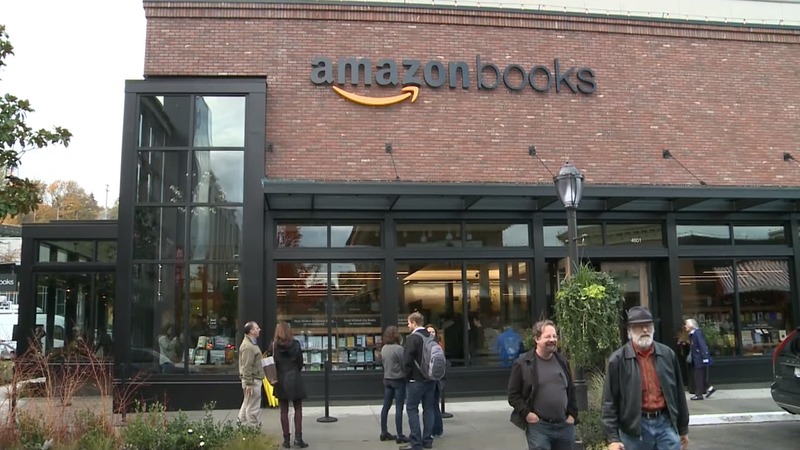 Some see Amazon Books for what it is, a wholly unremarkable bookstore, while others see it as either a threat to indie bookselling or as a replacement for the public library. Rob Salkowitz, on the other hand, sees Amazon Books as being all about the data. Describing Amazon Books as not "the grandiose retail book palaces that Barnes and Noble and Borders built in the late 1990s", Salkowitz hones in on the shopping experience and points out that Amazon might be interested less in selling stuff than in tracking what shoppers are doing in the store. Under the hood, the Amazon store has a few unusual features. 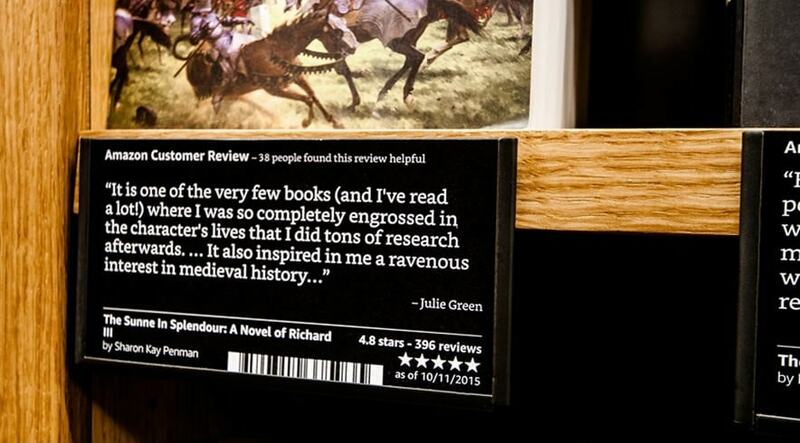 Every book has a shelf tag that includes a capsule review from the website, a star rating, and a barcode. There are no prices listed. To get the price, you scan the code with the camera of your smartphone and the Amazon app. If you don’t have a smartphone or the app installed, an associate can do it for you. This brings up the product page for the item you’re looking at, with full reviews, specs and pricing. Pretty slick, eh? But here’s where it gets interesting. If you are signed into the app with your account – as is likely – Amazon is immediately able to associate its online customer records with you, the customer browsing the shelves in its physical location. It knows your preferences, your buying history, your status as an Amazon Prime and/or Amazon credit card member, and who knows what else. Armed with that data, it can feed you recommendations, offer coupons and incentives, and do whatever it needs to do to close the sale as you are holding an item in your hand that you are considering purchasing. It seems clear that the shelf pricing model in the Amazon store isn’t a feature – it’s the product. By pushing pricing to the app, Amazon enables every offer, every recommendation and potentially every price to be personalized to each customer and timed to optimize every transaction. I don't have inside info from Amazon that proves he's right, but it would make a lot of sense. No, Amazon left the prices off so they could use the Amazon app to track which book caught your eye while you are in the store. When I wrote earlier this week that the store felt like a field experiment, I wrote that "Amazon is closely studying the wildlife to see how it interacts with the the test equipment". I thought that meant that Amazon would respond by changing the equipment around, but now I see another possibility; the whole point of the exercise, from Amazon's viewpoint, is studying the wildlife (as opposed to selling stuff). Salkowitz says that it's all about the data, and I agree with him. Amazon's focus on the data also explains why Stacy Claflin reported that Amazon Books did not accept cash; they want your credit card so they can track you better. To be fair, none of this is new; retailers have been using loyalty cards to track your shopping for decades. It's just that in the case of Amazon Books, we have a store that takes it to the next level. Where most retailers track your in-store buying patterns, Amazon is equipped to track your in-store browsing habits (just like retailers do online). If I were a competing bookseller, I would be more worried now than I was before. Amazon didn't just open a store; they are adapting their data-centric business methods to brick-and-mortar retail. Those methods are why Amazon is the single biggest online retailer, and now they've set their sights on b&m. It wouldn’t be the first time they did something like this–gathering data from app scanning. Remember that Christmas season a few years back when they first launched their showrooming application, and had customers going to all sorts of physical stores to scan prices so they could comparison-shop? Funny to consider, but this may be the first time that the term “showrooming” has been used in both its figurative and its literal sense at the same time. I’m less convinced that the store is about gathering data—although that assurredly is happening—than it is about using the data it has already. It’s basically an airport bookshop, located in a community, stocked with well-rated titles that Amazon knows already sell. It wouldn’t shock me if the mix is also influenced by ZIP code and other information it already has about people who might likely shop there. Yes, PW reported last night that Amazon did a market survey before they opened the store, and tailored the stock to match the population. I hadn’t thought about them using the the app to track browsing habits. That makes a lot of sense, though, because they want the experience in the store to be as close to the online experience as possible. The last line in the PW piece pretty much torpedoes the whole “one of a kind stunt” theory. Cast expects she’ll get to do more stores and she wouldn’t have returned to Amazon just for a one of a kind. There will be more Amazon stores. They may differ from the first but they will come. Oh, and here’s another thought: any customer who comes to Amazon Books and gets in the habit of using the Amazon app to check prices on the various books they have to offer there will leave the store knowing how to use the app—and might possibly be inclined to use it for showrooming in any other stores they visit in the future.